You are at:Home»Questions & Answers»How Can I Lose Fat and Tone Up My Lower Abs? 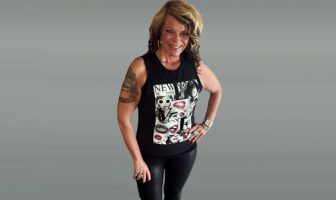 I am currently exercising at least four times a week on the elliptical trainer and I’m also doing some strength training with weights. My lower abs (from belly button down) have more fat and less muscle tone than the rest of my stomach and it looks really bad. How can I lose fat from my lower abs and what exercises can I do to tone up that area? #1. Eat an extremely clean diet.You need to really focus on eliminating all of the empty calories from your diet. Focus your attention on lean protein (chicken, eggs, steak, turkey), clean carbs like brown rice, yams, oatmeal and healthy fats. 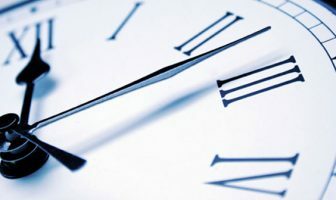 Really try to watch your starchy carb intake after 5pm and replace those starchy foods with veggies. Even though fruit has lots of vitamins and minerals, it also contains a lot of sugars (fructose) which get stored in the liver and can easily be converted to body fat. Limit fruit to 2-3 servings earlier in the day (before 3pm). Make sure to also watch out for liquid calories and avoid all fruit juices, sugary coffee drinks, sodas and alcohol. 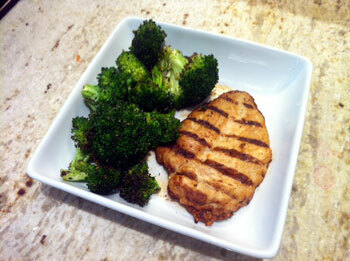 When in doubt, always look at your diet first if you are not losing body fat at the rate you want to. #3. Specific abdominal exercises that really blast your lower abs.The best way to tone your lower abdominals is to do exercises that incorporate leg lifts and decline angles. Also, depending on your physical capabilities, be sure to always use light to moderate weights when performing these exercises, if possible. Last, but not least, be sure to also train your lower back as this region essentially mirrors the abdominals and is a vital component of the trunk or “core” of the body. The abdominal muscles are just like every other muscle group in that they will respond (grow) better to training when weight resistance is used. In addition, just like every other muscle group, they can be overtrained. Therefore, be sure to give your abs time to recover in between workouts. This will allow the muscles in this area to grow and for your workouts to deliver optimal impact. Below are some great exercises that target the lower abdominal region. 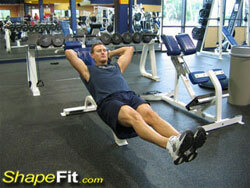 Decline Bench Reverse Crunches – Use an abdominal bench or a regular decline bench to get the most out of this exercise. What is a “decline” bench? This is a bench that when you lay on it your head will be below the rest of your body. Most modern abdominal and regular decline benches allow you to adjust the angle of the decline according to your comfort level. Keep in mind that you don’t need to hang upside down to achieve the desired effects of using a decline bench when training your lower abs. All you really need is a little decline to hit the lower abs at the angle you need. To perform decline bench reverse crunches, first secure yourself on the bench with your feet at the bottom and your hands gripping the top of the bench. Next, perform a reverse crunch motion just as you normally would making sure to flex and hold your abs at the top of the crunch. Perform 3 to 4 sets of 18-20 reps per set. Lever Seated Leg Raise Crunch – This is a great machine and great exercise for targeting the middle and lower abdominals. 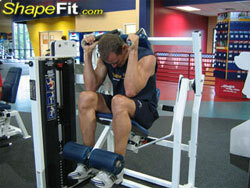 It incorporates both leg raises and weight resistance and is easy to perform. 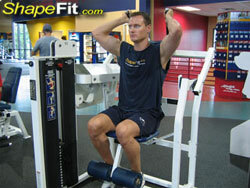 First, select the amount of weight you want to use for the exercise. Next, seat yourself upright in the machine with your feet secured by the padded bars and your hands grasping the handles above and slightly behind your head. Finally, crunch your abs forward while simultaneously lifting your feet to your chest (this will automatically bring your hands down toward your knees). Try to only use your abdominal muscles to perform this motion. Perform 3 to 4 sets of 18-20 reps per set. Hanging Leg Raises – This is one of the best exercises you can do to target your lower abdominals. The best thing about this exercise is that you can perform it any place where you can find something to hang from. Make sure to avoid swinging too much and really try to focus all your attention on crunching your abs at the top. 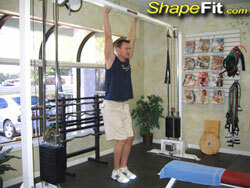 Hang from any type of overhead bar with a shoulder width grip. 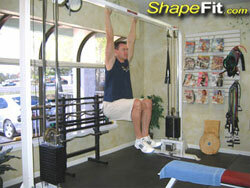 If you are in the gym, it will be very easy to find a bar to hang from. At home, you can either use a chin-up bar attached over your door or you can go outside to a local park and look for a kids play area with bars. While hanging, slowly raise your knees up to your waist and pause for a moment before lowering your legs down to the starting position. Keep your body stable and make sure to avoid swinging back and forth when performing this exercise. Should I Be Changing My Workouts and Training Routines?